who collaboratively produce artwork together. We’re definitely not always this serious. All of our prints are based off our original drawings, photographs, and concepts and are screen printed by hand by the two of us - literally and extensively. We take pride in keeping our business small and using no mechanical machinery in our printmaking. We work collaboratively on each print we create - each taking the lead on various tasks from the design development to the final printing, sharing ideas and feedback throughout the process to create a cohesive, distinguishable aesthetic throughout our work. The name “Lightbox” refers to the sunroom in our top floor city apartment. Always filled with natural light, it makes for the perfect spot for observing, drawing, and brainstorming while watching the hubbub of street life happening below. It's always been our favorite spot to share time at home together, so it seemed fitting to name the business we share our collaborative work through after it. When we’re not printing you can likely find us in our tiny kitchen cooking our favorite Thai recipes (Meredith) or baking the best bread from scratch (James), outdoors exploring a new city or landscape, or at one of our local neighborhood breweries. Both creatively driven individuals with backgrounds in architecture and design, it was only a matter of time before their shared love for design, along with food and travel manifested into a contemporary visual documentation of the impactful beauty of these elements. James began screen printing in college, learning the process through an elective class during architecture school. Years later, he met Meredith while she was in graduate school and they began printing together as a creative release from their academic and working worlds. 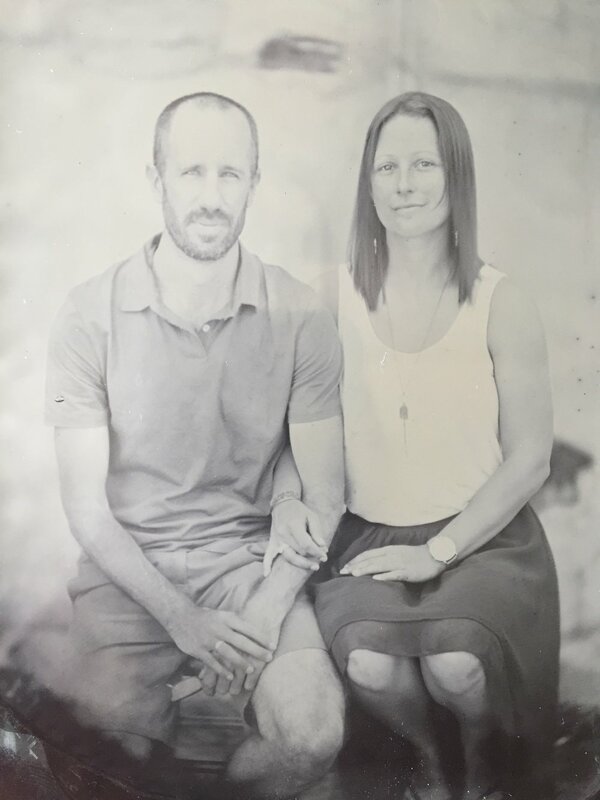 Everything seemed to gradually fall into place from there: casual printing led to a collaborative business of making and selling artwork together, and casual friendship led to a marriage of two kindred souls.